Take a relaxing respite from the hustle and bustle of this fast paced world, and step into the quiet, peaceful natural areas of Aiken County. Enjoy one of two SC State Parks as you camp, fish, hike or canoe down the South Fork of the Edisto River. Admission: $2 adults, $1.25 seniors. 15 & under, free. 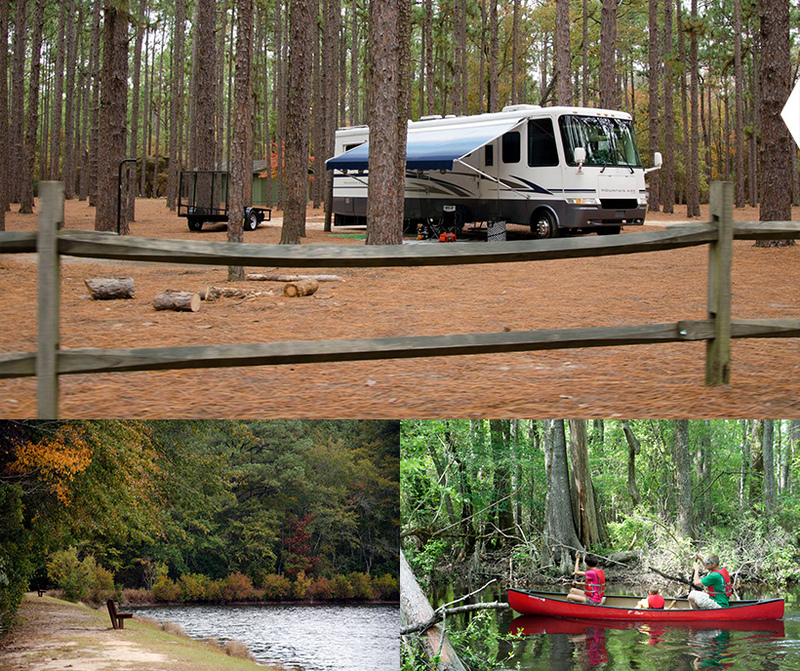 Features: Canoeing the Edisto River, fishing, picnicking, camping, hiking and canoe trails. Bird Watching, Pets (restraints required), Geocaching, Horseshoe. Firewood and fishing worms available for purchase. Campsites for RVs and tents, some primitive sites available. Canoe rentals. Aiken State Park is a 1067 acre combination of a river swamp, bottomland hardwood forest and dry sandhill pine forest; the latter provides evidence of an era when the sea reached this far inland. The four acre lake is fed by artesian wells. Artesian wells also gush up through fountains located throughout the park. Built in the 1930’s by the Civilian Conservation Corps. Rate: $15-$20/site/night. Prices subject to change. Note: Rates listed do not include applicable sales tax and nonrefundable reservation costs. Rate: Minimum rate: $10-$12.50 up to 10 campers. Rate increases by $5-$6.50 increments for each additional five campers. The South Fork bank area of the Edisto River is equipped with picnic tables, fire rings and a privy. This area is reserved for groups. $15/trip, and includes life jackets and paddles. Times: Th, Su and M at 10am, noon and 3pm; F-Sa at 10am, noon and 2pm. Please meet at the canoe take-out dock at scheduled times for shuttle. Private boats, canoes or kayaks are allowed on the South Fork of the Edisto River. Access at the state park boat ramp. Full-service RV park. Day, week, or monthly. Full hookups; 30 & 50 amps, level concrete runners, LP gas, usherette, hot ceramic showers, cable TV. Exclusive RV section with large lots, landscaping, paved streets and parking, street lights and patios w/accent lights. Pets welcome with some restrictions. 205 Duke Dr (corner Duke Dr & Columbia Hwy N), Aiken. RV campgrounds. Weekly camper rentals. Rental trailer parks. Full hook-ups with 30 and 50 amp service. Open year round. Daily, weekly, and monthly rentals. Campers available for weekly rentals. Coin laundry, showers, dump station, propane and Internet on site. Restaurant. Pets allowed.